Hidden History Center is a 501(c)(3) non-profit organization dedicated to the preservation and presentation of little-known history. We depend on your tax-deductible contributions to continue our work. The Columbus myth suggests that from US independence onward, colonial settlers saw themselves as part of a world system of colonization. “Columbia,” the poetic, Latinate name used in reference to the United States from its founding throughout the nineteenth century, was based on the name of Christopher Columbus. The “Land of Columbus” was—and still is—represented by the image of a woman in sculptures and paintings, by institutions such as Columbia University, and by countless place names, including that of the national capital, the District of Columbia. What historian David Chang has written about the land that became Oklahoma applies to the whole United States: “Nation, race, and class converged in land.” Everything in US history is about the land—who oversaw and cultivated it, fished its waters, maintained its wildlife; who invaded and stole it; how it became a commodity (“real estate”) broken into pieces to be bought and sold on the market. 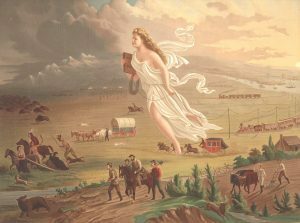 The history of the United States is a history of settler colonialism—the founding of a state based on the ideology of white supremacy, the widespread practice of African slavery, and a policy of genocide and land theft. . . . Writing US history from an Indigenous peoples’ perspective requires rethinking the consensual national narrative. That narrative is wrong or deficient, not in its facts, dates, or details but rather in its essence. 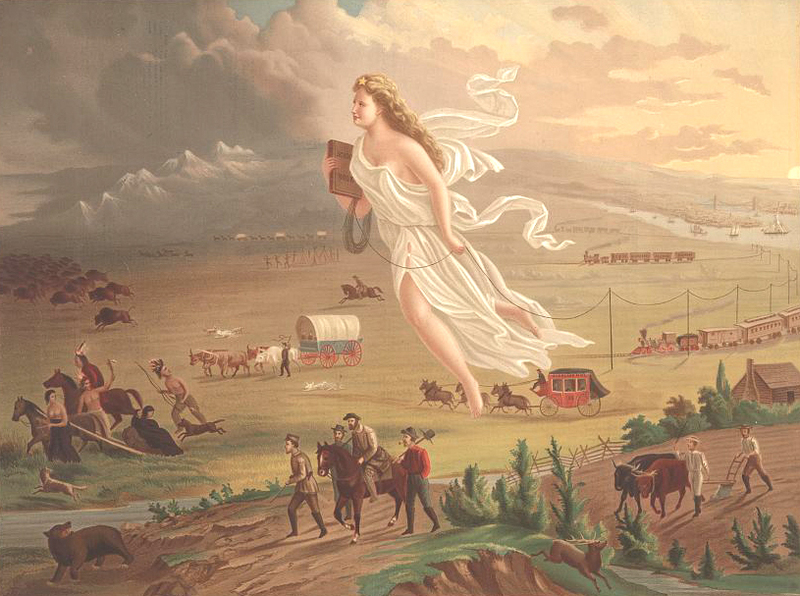 Inherent in the myth we’ve been taught is an embrace of settler colonialism and genocide. The myth persists, not for a lack of free speech or poverty of information but rather for an absence of motivation to ask questions that challenge the core of the scripted narrative of the origin story. How might acknowledging the reality of US history work to transform society? That is the central question this book pursues. The above excerpts are reprinted with permission from An Indigenous Peoples’ History of the United States by Roxanne Dunbar-Ortiz, Beacon Press, 2014, pages 1-2 and 4. Speaking about the book in December 2014, Dunbar-Ortiz describes connections between the centuries-long genocidal program of the settler-colonialist regimen and the US military today. It is critical to understand the continuity between the unrelenting frontier wars that began in the early seventeenth century and which moved overseas after the Wounded Knee Massacre in December 1890, symbolizing the end of Indigenous armed resistance in the continental US. I make throughout the book, connections between the U.S. military today and its foundation in these unrelenting wars that actually went up through 1890 and then moved overseas to the Philippines and the Caribbean with the same generals in the Philippines who had been fighting the Sioux and the Cheyenne in the Northern Plains. And interestingly enough, also, who were called in (one division of them) to fight striking workers in Chicago. So I think there [are] very interesting interconnections with the use of the military in the United States that we don’t always put together. The Second Amendment and the irregular warfare, these were mostly settler militias who could organize themselves. Andrew Jackson started that way as the head of the Tennessee Militia. [For] his militia’s war against the Muskogee Creeks, driving them out of Georgia, he was made a Major General in the U.S. Army. So it was a career builder as well to start a militia. But these were also used, especially after U.S. independence, as slave patrols, these militias, self-appointed militias. These militias would form to police – free – they weren’t paid to do it – and we still see the ghosts of this performing, actually today. Recording of Roxanne Dunbar-Ortiz at Green Apple Books in San Francisco on 4 December 2014. Produced by Time of Useful Consciousness Radio in Parts One and Two. Detailing the ways in which the conquest of lands that are today called the United States came to be claimed and owned by European men, reveal the processes and characteristics of settler colonialism. This specific brand of colonial usurpation is founded upon institutionalizing extravagant violence through unlimited war and irregular war. Extreme violence was carried out by Anglo settlers against civilians to cause the utter annihilation of the indigenous population. The goal of this extermination was to enable the settlers’ total freedom to acquire land and wealth. In the beginning, Anglo settlers organized irregular units to brutally attack and destroy unarmed indigenous women, children, and old people using unlimited violence in unrelenting attacks. During nearly two centuries of British colonization, generations of settlers, mostly farmers, gained experience as “Indian fighters” outside any organized military institution. Anglo-French conflict may appear to have been the dominant factor of European colonization in North America during the eighteenth century, but while large regular armies fought over geopolitical goals in Europe, Anglo settlers in North America waged deadly irregular warfare against the indigenous communities…. From the Introduction and Chapter 4, Bloody Footprints, pp. 7, 8, 58-9 (and also for pages 9 and 59), of An Indigenous Peoples’ History of the United States. Robert Williams is an author, legal scholar, and member of the Lumbee Indian Nation. In his 2012 book, Savage Anxieties: The Invention of Western Civilization he discusses the anxiety-producing imagery of the “savage” from the time of Greek colonizers to its influences today. Anglo settlers projected their own inner savagery outside themselves onto Indigenous people whose way of life was perceived to be so different that they could be branded as “other” and then destroyed. One instance of the savagery practiced by Anglo settlers was in the way scalp hunting came to be practiced. The roots of scalp hunting pre-date the Settler Colonialism project in North America. During the early 1600s the English conquered Northern Ireland, and declared a half-million acres of land open to settlement; the settlers who contracted with the devil of early colonialism came mostly from western Scotland. England had previously conquered Wales and southern and eastern Ireland, but had never previously attempted on such a scale to remove the indigenous population and “plant” settlers. The English policy of exterminating Indians in North America was foreshadowed by this English colonization of Northern Ireland. The ancient Irish social system was systematically attacked, traditional songs and music forbidden, whole clans exterminated and the remainder brutalized. A “wild Irish” reservation was even attempted. The planted settlers were Calvinist Protestants, assured by their divines that they had been chosen by God for salvation (and title to the lands of Ulster). The native (and Papist) Irish were definitely not destined for salvation, but rather the reverse, both in the present and hereafter. Bounties were paid for the Irish heads brought in and later only the scalp or ears were required. A century later, in North America, Indian heads and scalps were brought in for bounty in the same manner. Native Americans picked up the practice from the colonizers. The first English colonial settlement in North America had been planted in Newfoundland in the summer of 1583, by Sir Humphrey Gilbert. From “The Grid of History: Cowboys and Indians, Roxanne Dunbar-Ortiz, Monthly Review, 2003, Volume 55, Issue 03 (July-August). In Chapter 4 Dunbar-Ortiz explains more about how scalp hunting became routine amongst Anglo settlers starting in the mid 1670s and cites John Grenier making the point that with settler authorities offering bounties for scalps, “they established the large-scale privatization of war within American frontier communities.” Understanding the savagery visited upon the nations and communities of Indigenous peoples at the hands of Europeans bent on taking their lands by extirpating them provides a more holistic understanding of how the commonplace violence expressed today throughout the United States has its historical roots in the founding centuries of this settler colonialist state. Dustin soon became a folk hero among New England settlers. Scalp hunting became a lucrative commercial practice. The settler authorities had hit upon a way to encourage settlers to take off on their own or with a few others to gather scalps, at random, for the reward money. “In the process,” John Grenier points out, “they established the large-scale privatization of war within American frontier communities.” [Grenier, First Way of War, pp. 39-41.] Although the colonial government in time raised the bounty for adult male scalps, lowered that for adult females, and eliminated that for Indigenous children under ten, the age and gender of victims were not easily distinguished by their scalps nor checked carefully. What is more, the scalp hunter could take the children captive and sell them into slavery. These practices erased any remaining distinction between Indigenous combatants and noncombatants and introduced a market for Indigenous slaves. Bounties for Indigenous scalps were honored even in absence of war. Scalps and Indigenous children became means of exchange, currency, and this development may even have created a black market. Scalp hunting was not only a profitable privatized enterprise but also a means to eradicate or subjugate the Indigenous population of the Anglo-American Atlantic seaboard. [Ibid. pp 41-43.] The settlers gave a name to the mutilated and bloody corpses they left in the wake of scalp-hunts: redskins. From Chapter 4, Bloody Footprints, pp. 64-5, of An Indigenous Peoples’ History of the United States. It follows that the commonplace violent nature of today’s culture in the United States would have as its roots, generations of US Americans who were raised within a tradition of killing indian men, women, and children as part of the genesis of a shared American identity as well as the shared experience of engendering profitable privatized enterprises resulting from such extravagant violence.